Looks great on the outside! I hesitate to call this a “restoration”, and it isn’t really much of a repair, so maybe I should call this a rehabilitation? It didn’t even take that long. In fact, I spent more time shopping for the right saw set so that I wouldn’t have to do a whole lot to it in the first place. I am, however, fairly adept at navigating your favorite auction site and mine – eBay. So let’s wax philosophically about that for a bit! When I was told I had to have a saw set for Matt Cianci‘s Build A Back Saw class I’m taking next month, I started looking for one in familiar hunting grounds. Matt recommended trying to find the Stanley 42x, as it is the quintessential saw set, the one everyone compares every other saw set to. In cases like this, where I am well aware of what I don’t know, I tend to stick to the advice of others who I believe ARE in the know. Thus began my (fairly short) search for a Stanley 42x. Fully disassembled… there isn’t much to it. After a few weeks of watching the auctions (what? You don’t just go out and buy the first one you run across, do you? ), I determined that most of the Stanley 42x saw sets tend to sell for anywhere between $30 and $50, regardless of condition. In other words, one that is all beat to crap can sell for the same price as one that is in near perfect condition. My goal became: Buy one that is in near perfect condition and save myself a lot of trouble. Patiently, the eHunter waits on his haunches by the Stanley watering hole. He spies his target – good condition, no box (to discourage high-bidding collectors), low starting price, late night ending time – but makes no move. Instead, he watches to see if his quarry will come closer. It does! In fact, it heads right for him! He waits… and waits… until just the right moment, when he STRIKES, mere seconds before it gets away!! And snags a (damned near) perfect Stanley 42x saw set for the acceptable price of $38. And when it arrives in the mail, it is true to the surveillance photographs our eHunter so closely reviewed. It’s only fault is one that cannot be photographed – the handle does not easily return to its starting position when grasped and released; it appears the springs are at the end of their life. Once again, Joe Federici came to the rescue. Joe knows saws – probably better than most people I know, and certainly better than me – so I turned to his website for information. A quick stop by his on-line store and I had two brand new Stanley 42x saw set springs coming my way, along with a full set of instructions for replacing them. With replacement parts and my trusty Millers Falls No. 63 at hand, I pulled out Joe’s instructions and started reading them. But I have to be honest with you… I made it about half way through the first step before I said, “Oh, I got this…” and set them aside and just started into it. It was a pretty simple and painless procedure. 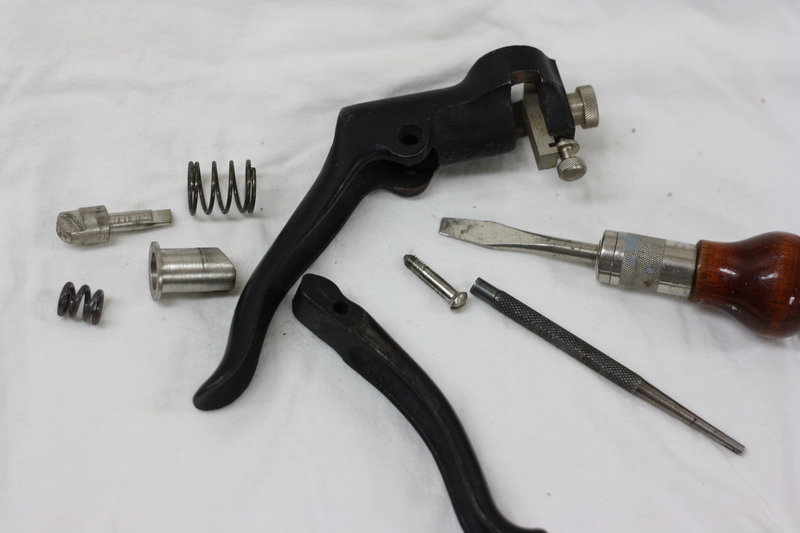 Remove the only screw you can find, remove the handle, remove the anvil and cylinder (and accompanying springs), replace springs, add a bit of lithium grease for lubrication, replace anvil and cylinder, replace handle, replace screw. Give it a few squeezes to make sure you didn’t bugger anything up and you’re good to go. Done! The difference is amazing! I did go ahead and remove some dust from the under side of the grips and… well… seriously, that was about it. This thing was so clean it had about 98% of the original finish. The only part with any kind of wear showing was where the teeth on either side of the tooth you’re setting rest during the process. 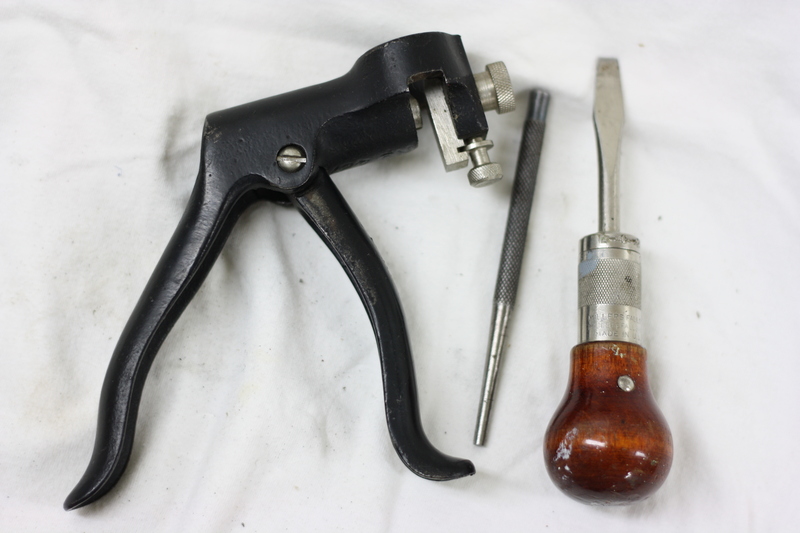 This was about the most painless tool restoration rehabilitation project I’ve done in seven years. Looks just like it did when I started, right? Thanks, Chris! And thanks for reading! You will enjoy your class it is time well spent. Matt is a thoughtful and patient teacher. he is also a wealth of knowledge all things saw nerd so be sure to pick his brain. I took a class with him last year and having never touched a rasp before I turned out a lovely looking saw; it works pretty well too 😉 Seeing that you have a blog could I ask you to document your saw build in the class? I think readers would really enjoy reading about your experience. One more thing, if you are not bringing your own wood for the handle be certain to ask him to use his piece of figured holly……. Oh, are YOU the one what found the great holly for a tote in his class I read about a while back, Nick? Pleasure to meet you! I’ll definitely be writing something about it. I’m the editor for the St. Louis Woodworkers Guild, so… It’s almost a requirement. I might break the class down into two entries for here, though, whereas the newsletter article will be condensed to one. I’ll ask about the holly, though I’ll know if he has it before I ask… I’m putting him up for the weekend, so he’s shipping a box of stuff for the class to my house. 😉 And… I get to pick his brain for much longer than the others… Perks and all that. One in the same. I can’t wait to follow your blog of the build. It is an interesting subject that most will find they can do at home. Plus, any way to get Matt more press the better. If I didn’t already have something in mind, I’d ask you if you had any more of that holly! As it stands, though, I already have several contenders for the tote, including some nice quartersawn English beech. But I have something else up my sleeve, as well. I do try to give out good press when I can, if you hadn’t already noticed. Look for those entries in about a month or so! I’m the last person who should recommend a wood for the tote, but I will say use whatever speaks to you. The only criticism I’ll offer is that I find saws that I’ve had my hands on made from the dense tropical stuff don’t feel balanced correctly. That said, I’m a hypocrite because I’ve been searching for a large enough piece of ebony to make a twin for the holly saw. And most importantly don’t hesitate to change the handle when you make it. I traced a handle Matt had and then I changed the lines to please my eye before cutting the handle out and also on the fly during shaping. Like I said Matt is such a fun teacher you’ll have a great time. I had my friend Phil Edwards (www.phillyplanes.co.uk) send me a few blanks of the QS English Beech because my favorite back saw is a small Tyzack dovetail saw, with a tote made from perfectly quartersawn English Beech. My plan was to use a pattern for the open-handled Tyzack backsaw tote I found (hmmm… having trouble finding that pattern atm. Did find the close-handled one, though. I’ll keep looking) so I could have a matched pair. Plus, I love the feel of that Tyzack dovetail saw, so I figured I couldn’t go wrong using it again. But… if you follow Mark Harrell on Facebook, maybe you have some idea as to what other wood I’m considering using. I’m not a facebooker so I can’t make a guess. I understand your love of the Old Tyzack handles. I have a few old Sanderson Bros. Saws and the handles fit my hands perfect. I think they were made for folks without giant gorilla mitts……. I don’t have particularly large hands so some of the Disston saw handles fit my hand like Shaq’s sneakers. I too have a 42X and am having trouble getting the inner cylinder that houses the set plunger out. There doesn’t appear to be any way this beast is coming out even though it slides back and forth easily. 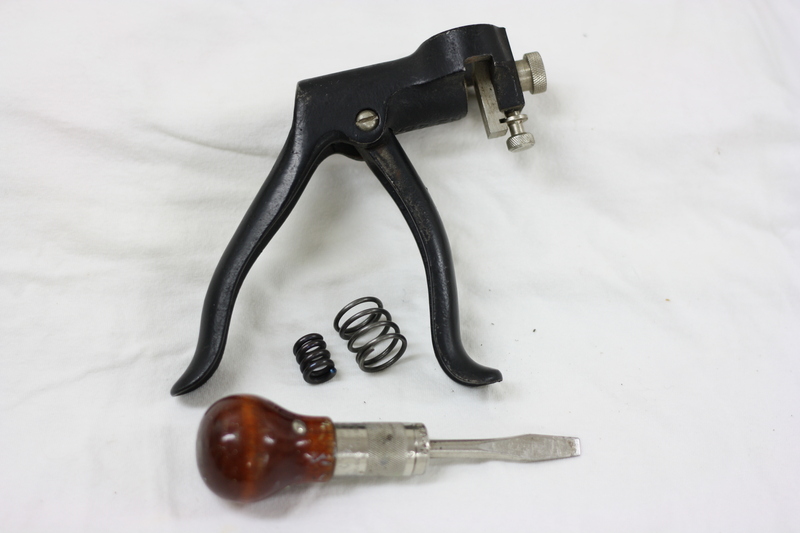 I am trying to access the small spring to access and lube. Do you know what part is hanging up? Any way you can get me some pictures? My email address is on my Contact page. Or if you have a blog or website you can load them to (like Flickr) then I’d be happy to compare your 42X to the one I have and see if I can spot the difference/problem area.